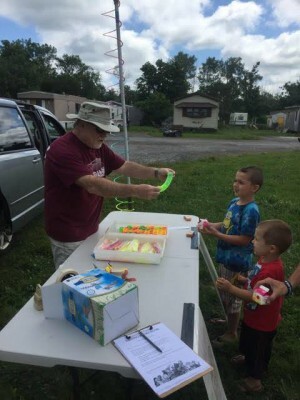 OSWEGO – Driving Books Home, Oswego’s Bookmobile, was awarded a grant from the Oswego City-County Youth Bureau to pay for costs associated with the appearance of science teacher Thomas Altman. Tom Altman presents things that fly. 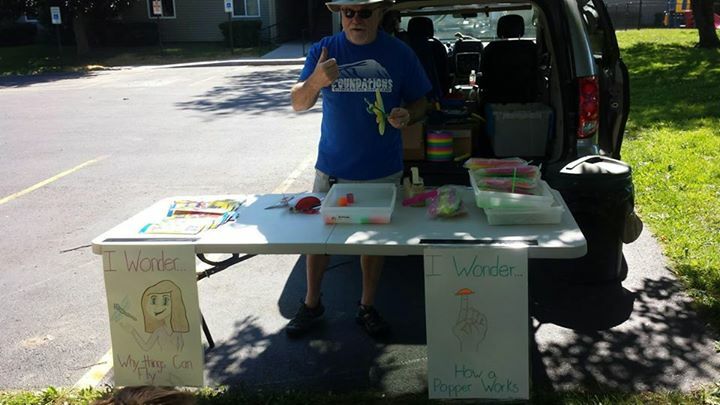 He brought science lessons to summer readers in the form of fun activities. Altman appeared at the bookmobile’s regular program stops during the week of July 20-24. Activities he created supported the week’s theme of I Wonder and included I Wonder Why Things Fly and I Wonder Why Things Move. In I Wonder Why Things Fly activities children used plastic propellers that twirl in the hand and fly. Younger children who couldn’t work the propellers used finger poppers and little flying insect kits made of Styrofoam. In I Wonder Why Things Move, children used little plastic Slinky manipulatives to explore movement. Children selected and took home related science books at their independent reading levels, guided by the literacy specialists, teacher, Pre-K specialist, AmeriCorps volunteer, SUNY Oswego graduate assistant, and other volunteers who make up the bookmobile staff. Children had fun while learning science concepts with Altman, had snacks and enjoyed free books about science topics. The bookmobile is grateful for the grant funding from Oswego City-County Youth Bureau that made these activities possible.